Our code has been broken for weeks. Compiler errors, failing tests, incorrect behavior plagued our team. Why? Because we have been struck by a Blind Frog Leap. By doing multiple concurrent changes to a key component in the hope of improving it, we have leaped far away from its ugly but stable and working state into the marshes of brokenness. Our best intentions have brought havoc upon us, something expected to be a few man-days work has paralized us for over a month until the changes were finally reverted (for the time being). Lessons learned: Avoid Frog Leaps. Follow instead Kent Beck’s strategy of Sprinting Centipede – proceed in small, safe steps, that don’t break the code. Deploy it to production often, preferably daily, to force yourself to really small and really safe changes. Do not change multiple unrelated things at the same time. Don’t assume that you know how the code works. Don’t assume that your intended change is a simple one. Test thoroughly (and don’t trust your test suite overly). Let the computer give you feedback and hard facts about your changes – by running tests, by executing the code, by running the code in production. What happened? We have batch jobs whose configuration properties may be set via (1) command-line arguments or (2) job-specific or (3) shared entries in a file. The jobs used to access it via the static call Configuration.get("my.property"). 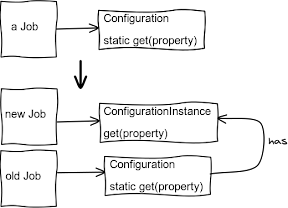 Since a global, automatically loaded configuration makes it impossible to unit-test the jobs with different configurations, we wanted to replace the singleton with instances of configuration passed around. I will describe briefly our failed refactoring, propose a better way to do it, and discuss how to evolve and refactor software without such failures. We have started by replacing the static Configuration with three instantiable classes, each having only a single responsability (SRP). Then we have modified each job to accept/create the one it needed. We have also renamed some command-line arguments and properties to something more understandable and made various small improvements. Finally, we have replaced the (mis)use of the configuration system for storing information about where the jobs have finished their work the last time (“bookmarks”) with something better. As a side-effect, there were also some other changes, for example the default configuration was no more loaded from a location on the classpath but from a relative file system path and the command-line arguments were processed little differently. All but one tests were passing and all looked well. It has been more complicated (a change required other changes, the original design was too simplistic, etc.) and thus took longer than expected but we have finally managed it. Even if we managed to fix all the problems, another one would have remained. The changes weren’t backwards compatible. To be able to deploy them to the production, we would need to stop everything, update (correctly) all the configuration and our cron jobs. A potential for many mistakes. Does it mean that improving software is too risky to pay off? No if we are more careful, proceed in small, safe, verified steps and minimize or avoid disruptive changes. Let’s see how we could have proceeded if we followed these principles. Once this is finished for all jobs, we could change the instantiation of jobs to pass in the ConfigurationInstance. Next we could remove all the remaining references to Configuration, delete it, and perhaps rename ConfigurationInstance to Configuration. We could regularly deploy to our test/staging environment and eventually to production to make sure that everything still works (which it should for the changes are minimal). We could/should also introduce code for automatic migration from the old configuration to the new one – for example to read bookmarks in the old format if the new doesn’t exist and store them in the new one. For properties we could add code that checks for both the old and the new name (and warns if the old one is still used). Thus deploying the changes would not require us to synchronize with configuration and execution changes. 1) Notice that Java doesn’t allow us to have both static and non-static method of the same name so we would need either to create instance methods in Configuration with different names or, as we did, create another class. We want to keep the same names to make migration from the static to the instance configuration a matter of a simple and safe search and replace (“Configuration.” with “configuration.” after having added the field configuration to the target class.) “ConfigurationInstance” is admittedly an ugly name but easy and safe to change later. Changing legacy – poorly structured, poorly tested – code is risky but necessary for the prevention of its further deteroriation and for making it better and thus decreasing its maintenance cost. It is well possible to minimize the risk – if we are cautious and proceed in small, safe steps while verifying the changes regularly (by testing and deploying to staging/production). What is a small and a safe change? It depends. But a good rule of thumb might be that it is such a change that (1) everybody else can daily merge in and that (2) can be then deployed to staging (and, f.ex. a day later, to production). If it should be possible to merge it in every day then it must be relatively small and non-destructive. If it should be deployed daily then it must be safe and backwards-compatible (or automatically migrating old data). If your change is larger or riskier than that, then it is too large/risky. Sprinting Centipede – series of tiny changes: To make a change in small and safe steps, we often need to break it down and continually evolve the code towards the target design through a series of small changes, each one in a limited area of the codebase and along a single axis, changing a single thing only. The smaller and safer the changes, the faster we can perform and verify them and thus change quite a lot over time – this is what Kent Beck calls the Sprinting Centipede strategy. Parallel Design: Sometimes a change cannot be really broken down, such as replacing a data storage with another one. In such a case we can apply for example the Parallel Design technique, i.e. evolving the new code, while still keeping the old code around. We can, for instance, first write only the code to store data in the new database; then start also reading from it while also reading from the old database, verifying the results are same and returning the old one; then we can start returning the new results (still keeping the old code around to be able to switch back); finally we can phase out the old code and storage. Prerequisities: It is of course possible to follow the Sprinting Centipede strategy only if you can build, test, and deploy and get warned about possible problems quickly. The longer the test and deployment (and thus feedback) cycle the longer steps you must make otherwise you will spend most of the time waiting. How can I deploy to production a change I am not completely sure is correct? It might seem slow to follow the Sprinting Cantipede strategy of software evolution, i.e. proceeding in small, safe, largely non-disruptive, incremental steps while merging regularly with the main development branch and verifying the changes often by running tests and deploying to the production environment. But our experience has shown that a Blind Frog Leap – a hope-driven large change or batch of changes – may actually be much slower and ocassionally infeasible due to unexpected but always present complications and defects and consequential delays, diverging branches etc. And I believe that this happens quite often. Therefore do change only one thing at a time, preferably so that the change can be deployed without requiring other (configuration etc.) changes, collect feedback, make sure that you can stop the refactoring at any time while gaining as much value as possible from it (instead of investing a lot of effort into a large change and risking that it will be abandoned completely). What is your experience? It is noteworthy that a similar problem happens too often on the level of projects. People try to produce too much at once instead of doing something minimal, deploying, and continuing the development based on feedback rather than believes. I’d like to thank to my colleagues Anders, Morten, and Jeanine for their help and feedback. Sorry Anders, I couldn’t make it shorter. You know, every word is a child of mine :-). This entry was posted in Technology and tagged design, refactoring. Bookmark the permalink.